For the BBC television series, see The Smoking Room. A smoking room (or smoking lounge) is a room which is specifically provided and furnished for smoking, generally in buildings where smoking is otherwise prohibited. Smoking rooms can be found in public buildings such as airports, and in semi-public buildings such as workplaces. Such rooms are equipped with chairs, ashtrays and ventilation, and usually free to enter although there may be a smoking age restriction (usually 18). A cigarette company sometimes sponsors these smoking rooms, displaying its brand names on the room walls and financing the room or its maintenance. Cigarette companies have worked hard to ensure smoking was accommodated in major airports, which are high-profile locations serving many people who are often bored or nervous. Initially providing smoking and no smoking areas was their goal but when that policy failed they fell back on ventilated smoking rooms. When the Crimean War during the 1850s popularized Turkish tobacco, smoking gained in fashionable popularity but was considered indelicate. After dinner in a large private house, the gentlemen might retreat from the ladies to a smoking room, furnished with velvet curtains and decorated to masculine tastes (wealthy owners would often choose Turkish themes and weapons collections), and replace his tail coat with a comfortable velvet smoking jacket and cap. The velvet was intended to absorb the smoke, to avoid contaminating other rooms and clothes. In the United Kingdom smoking is illegal in any enclosed place where staff are employed, so that smoking rooms cannot be provided and facilities must be outdoors; apart from private homes, almost the only legal exception is for smoking rooms in tobacconists where customers may sample the wares. Mental health units in the NHS providing long term in-patient care also have an exemption allowing the provision of designated smoking rooms for patients. The Houses of Parliament, where these laws were passed, are a Royal palace, so are also exempt. 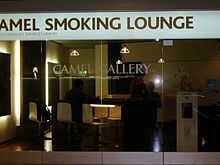 Wikimedia Commons has media related to Smoking rooms. ^ Pion, M (1 March 2004). "Airport smoking rooms don't work". Tobacco Control. 13 (90001): 37i–40. doi:10.1136/tc.2003.005447. PMC 1766150.